Because teeth can continue to move throughout life, we feel that individuals who have undergone orthodontic therapy should wear retainers indefinitely. A patient should wear retainers all the time for several months following the removal of braces. After given the okay by Dr. Guirguis, the patient can wear the retainer just at night. This is to allow the wisdom teeth to develop without ruining the patient’s beautiful smile. Dr. Guirguis will see you every six to nine months to make recommendations on the wisdom teeth and an X-ray will be taken periodically. This wire should stay on forever. The only exception is if your family dentist says you are not keeping it clean and it is beginning to cause gum or bone problems. If this should occur, please have the wire removed and replace it with a removable retainer. 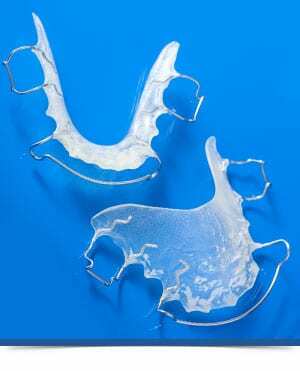 The removable retainer should then be worn as Dr. Guirguis prescribes. The fixed wire will protect the teeth as the patient gets older and your facial muscles get tighter. Please have this wire monitored by your family dentist at your six-month check ups. The patient should continue practicing proper oral hygiene procedures at home, to include thorough brushing and flossing techniques, and should see their family dentist every six months for cleaning and dental examinations. I have been with this Ortho for almost a year now and I have ZERO complaints. It's rare to find a good doctor AND a good staff in any medical field. I have had nothing but good experiences with each staff member there. They are incredibly nice and go above and beyond. Just yesterday I was completely out of elastics but wasnt going to be able to make it to the office on time to pick them up. They offered to leave them in an envelope outside for me. It sounds insignificant but I thought it was sweet as any other place would have just told me to come during work hours. Highly recommend this place!!! 10 stars! Love this Business. My family and I have been with them even when management changed a couple years back. The staff is always friendly, Doc is amazing and knows what he is doing. The whole staff is in great rythem with eachother and it shows through their teamwork. Only thing is Doc is not in Thursdays so makes it difficult to set appointments since I have a strict workplace, but nonetheless they work with you to get you checked and off with a smile. Dr. Guirguis is one of the most genuine orthodontist that I have ever known. I've seen many transformations and have had the pleasure of working alongside Dr. Guirguis and his wonderful staff, and would highly recommend his office.